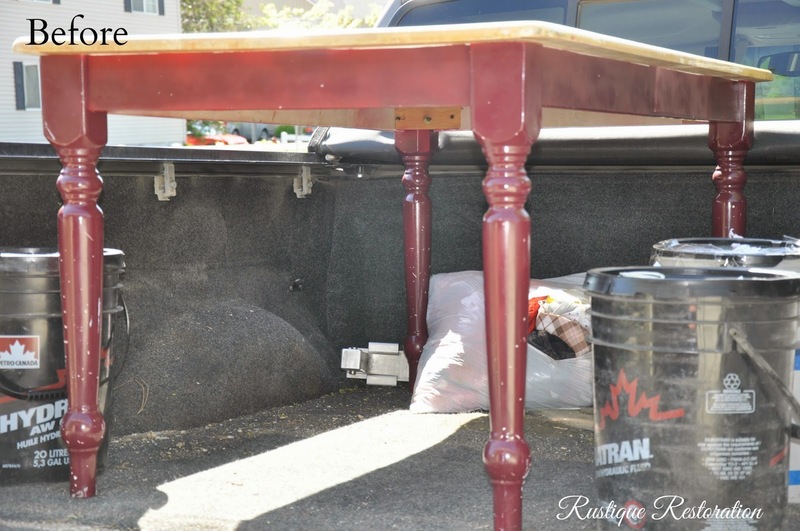 Rustique Restoration: Portobello Farmhouse Table Set with Dark Walnut Tops! Portobello Farmhouse Table Set with Dark Walnut Tops! Hello everyone! I hope you have all been enjoying some warmer weather wherever you may be! It's been so lovely here in Boise. We were at 84 degrees yesterday. The flowers have been blooming like crazy, I've been harvesting my strawberries for a few weeks now. It's just beautiful! So I'm sharing my latest Farmhouse Table set with you today. I painted this one in a light gray, and then hand distressed the whole thing, and finished the base off with a brown glaze, giving it that dirty gray color. I am calling this color Portobello. I then stained the top in a Dark Walnut. I love the dark top and gray color combination together! It's very French Farmhouse to me. I did a simple tablescape for my little mini photo shoot, using whites and Lavender. Check out what this beauty looked like before I had the chance to work on her. Kind of a reddish maroon paint and light maple top. I sanded it all away and gave her some new finishes. It doesn't even look like the same table anymore! I beat the entire table up with a hammer and some screws. I use the screws to make those neat little bird pecking holes. They always catch the glaze too. I am just loving my flowers this year! I picked up several Salvia plants and the pops of blues and purples are just stunning! Well thank you as always for stopping by to see what I've been up to! I hope you all have a lovely week!